Cryptocurrencies, also called virtual currencies or digital cash or tokens or altcoins, continue to make headlines for various reasons. While these currencies have been generating a lot of buzz and interest, there is also a great deal of confusion regarding their taxation since even the Internal Revenue Service (IRS) has provided very little guidance on this topic. As cryptocurrencies are housed in a digital platform and are not traditional currencies like dollar or pound, they are treated differently for tax purposes. The IRS classifies cryptocurrencies such as Bitcoin, Ethereum and Ripple as intangible property. The investors holding any of these cryptocurrencies must report the capital gains or losses made during sales or exchanges with the realization method on their tax returns. For instance, if you bought a digital currency for $100 in March and later sold it for $120 in June, the capital gain of $20 should be reported on that transaction. In 2014, the IRS made it clear that if a virtual currency is convertible to cash, then it will be treated as a capital asset. This means the capital gains rules apply to any gains or losses on virtual currencies as well. The capital gains and losses are calculated on cost basis at the time of your purchase, minus the cost of the cryptocurrency at the time of a taxable event. And taxable event for cryptocurrency means when you use your cryptocurrency to trade for cash, to buy other cryptocurrency, or to purchase goods or services. So, whenever you trade cryptocurrency or leverage cryptocurrency contract or exchange these currencies, even if it’s not converting it back to US dollars, the realized capital gain or loss on each trade has to be reported. 1. If you are a full time cryptocurrency trader and if it is your primary profession, then it is treated as income instead of capital gain. 2. If you are involved in cryptocurrency mining, any cryptocurrency earned through mining is treated as income. 1. 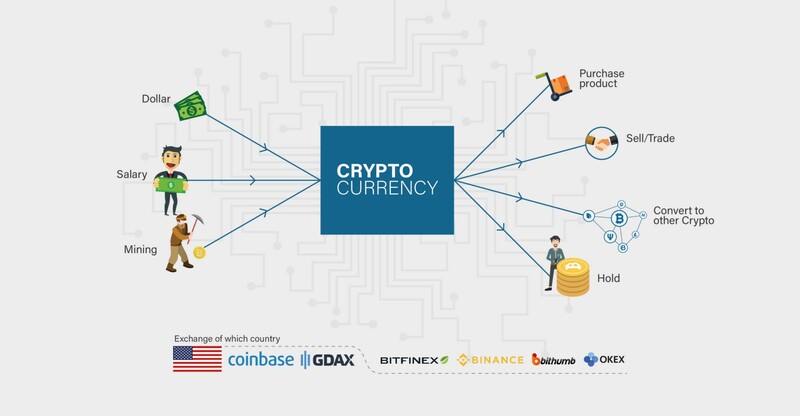 Convert cryptocurrency to US dollars on each purchase or sale using the market value of the cryptocurrency on that day in US dollars. 2. Use cryptocurrency as a functional currency and use its average value in terms of US dollar conversion rate for the tax year. But remember, tax treatment depends on how you hold and use your cryptocurrency. If cryptocurrency is used to pay for goods and services in the form of functional currency, it must be reported under income. For instance, if you’re getting paid in Bitcoin, then you have to convert the value of Bitcoin to dollars on the day of payment as wages paid in digital currency will have the same tax as dollar wages. Even if you are a self-employed individual involved in sales transactions of cryptocurrency, you must convert the value of digital currency to dollars as of the day of receipt and report the amount on your tax return. If you’re holding cryptocurrency as a capital asset, it will be treated as property for tax purposes. The tax levied on cryptocurrency will be the same as property tax. For the cryptocurrency held as a capital asset, any gain or loss made during an exchange is taxed as a capital gain or loss. Some people are involved in digital currency mining. These miners secure and verify transactions and release new digital currency using special software and computer resources. According to the IRS, the earnings made from such mining activities of any form of cryptocurrency have to be included in your gross income after calculating the value of cryptocurrency in dollars. So, if you get $100 worth of Bitcoin as a reward from your network for your mining, the $100 will be added to your gross income while calculating your tax.